Marking the occasion of 150 shows we’ve huge pleasure in presenting an exclusive and rare session mix from Objekt. Before that, music by Pan Sonic, Broken Note, Blackmass Plastics, Ursa, and Mondkopf. er, not sure, it’s on ant-zen from like 2004, maybe orphx? TJ Hertz aka Objekt needs little introduction. Following his self released EPs back in 2011 TJ has become a producer, remixer and DJ of cult like status. And rightly so. His recorded sets are few and far between and whilst he might not be on club flyers every weekend, when he is, you can be sure he will be the highlight of the weekend. Without a doubt he is one of my absolute favourite DJs and to be able to present his session tonight makes me quite warm and fuzzy. Things are looking good as far as releases go for TJ this year. First up will be his track Balloons, forthcoming on London’s hard rave label Power Vacuum as part of the Vectors compilation (above). It’s a compilation he shares with JoeFarr & J.Tijn, Positive Merge and An-i (who’s track Convo you’ll hear around the 35minute mark in his session). In a few weeks he’s a Jon Hopkins remix surfacing; a collaborative track with The Analogue Cops (which is also included in his session) and a spilt single that he can’t say any more about at the moment. That’s due in a few months. Those of you in London can catch him supporting Jon Hopkins this Saturday at The Forum. Reaching the milestone of 150 shows has been an immeasurably interesting journey, thank you for joining us this far. Mantis Radio no. 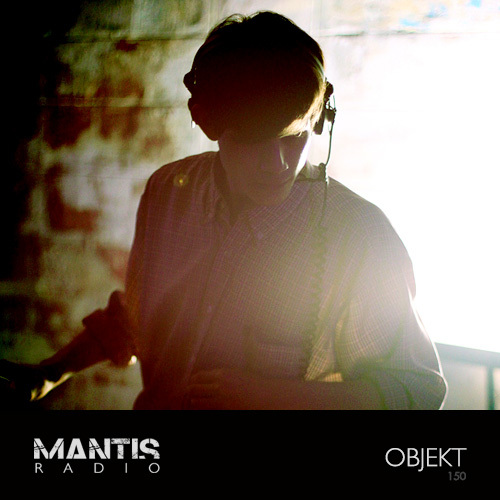 150 – tonight we’ve Objekt in session.